While Vermonters in my homestate aren’t proud enough of their beautiful mountains to preserve them, and so have decided to install wind-parks on ridgelines, see here and here, Scotland has decided they want no part of such lunacy. Must be the fine whisky Scots produce and drink there. They ought to send some of those spirits over to Vermont. 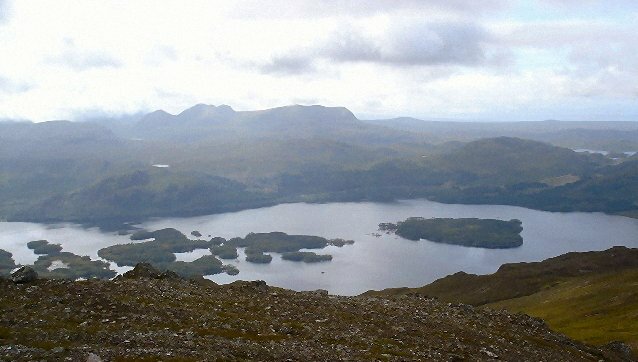 Loch Maree. Photo credit: Roger McLachlan, Creative Commons Attribution Share-alike license 2.0. Renewable energy website Recharge here writes that the “Highland Council planners shot down three high-profile projects totalling nearly 80 turbines in a two-day rout for developers”. It’s good to see there is still some environmental sanity left on the planet. The MCofS welcomed the news today that The Highland Council North Planning Committee decided to reject 2 massive onshore wind farm planning proposals. · Glemorie Wind Farm: to the north of Dingwall with a proposed 34 turbines and 35 kilometres of access track. The MCofS originally objected to the proposal because it contravenes The Highland Council’s own policy on onshore wind farm locations. This is a refreshing development that hopefully will spread to other regions of the planet. Blasting mountain ridge lines and gouging miles of access roads though forests and landscape in order to soothe environmental paranoia and alleviate irrational fears of a climate catastrophe is environmental lunacy of an unprecedented scale. Unfortunately, places like Vermont have become psychological basket cases in that respect. Germany has hardly been immune to the insanity. It’s 130 billion in renewable energy investment will theoretically postpone global warming a whole 23 hours, read here. At that rate it would cost the world $4,745,000,000,000,000.00 (4.745 quadrillion) to delay global warming 100 years, provided the dubious theory were true. That’s a million dollars for every family on the planet (if I didn’t lose or gain any zeros in that big number calculation). It’s truly mind-boggling how easily some people can get carried away by madness. When a few dumb cows start running, the whole herd often follows. Hats off to Scotland. Maybe I’ll break open that bottle of Doublewood Balvenie I got for Christmas and give a toast. Keep some of that whisky for a future date! The issue of these three windfarms has not been settled by the decision of a planing committee of a local council. The government in Edinburgh can over-rule that decision, and it is a government that might reasonably be described as crazy about renewables. It has already done a great deal of harm to Scotland with this craziness, and may yet do more. It is being egged-on by a well-connected pressure group calling itself the 2020 Climate Group: http://www.2020climategroup.org.uk/about-2020/the-2020-story/. I think there are similar groups elsewhere, e.g. http://www.theclimategroup.org/what-we-do/network/. A mix of business people, government agency workers, and sundry other organisations with a vested interest in pushing ‘renewables’, ‘sustainable development’, ‘low-carbon economy’, and suchlike spin-offs from the climate alarm movement. Although that movement may well be sinking in a morass of shoddy and overblown claims, the spin-offs can still hope to distance themselves from it enough to not be dragged down at the same time. The mess that societies around the world will have to clean up thanks to the shocking impact of climate alarmism will not go away even when that alarmism is widely discredited. But perhaps, in Scotland, public outcry over the foolishness and destructiveness of windfarms may yet score some early victories and stop some of them being built. The decision of the planners may well deserve a small toast, but it is too early yet to declare a victory. I guess I’ll have to settled for Bourbon then. We wait with interest to see the response of the SNP and wee Alec and the pressure from central government, especially the Lib Dims. Similar fights are happening in central Wales, with our limited Welsh Assembly pushing hard for the bird mincing windmills. BTW great blog I read every day. Thanks for the compliment – I really appreciate it. Aye, the council are likely to be overruled, as John points out. But enjoy the Balvenie anyway, Pierre. Watch the SNP government overrule this decision.